The ecommerce industry in Europe consists of three major players, upcoming markets and thriving startup scenes. But it’s difficult to see the European ecommerce industry as one, as it consists of several regions that all play their own role. Let´s have a look at ecommerce in Europe. Cards account for the largest share of business-to-consumer ecommerce transactions in Europe, as research from yStats.com shows. Digital wallets are second best. In the UK, credit cards are very popular: about four in ten online transactions are paid this way. Debit cards account for 35 percent of all online transactions, while PayPal is the country’s third most used online payment method. Germans like to pay with invoice, while French consumers use debit card Carte-Blue, MasterCard, American Express and PayPal. In the Benelux, iDeal (the Netherlands) and Bancontact (Belgium) are very popular. For more common payment methods in Europe, check out this overview. A Mastercard survey from 2017 shows that one in four Europeans who have internet access have shopped online at least once a week, while over 60 percent shopped online once a month and 6 percent even bought products or services via the internet every day. You can read more about online consumer behavior in Europe on our dedicated page. PostNord researched big ecommerce countries in Europe. 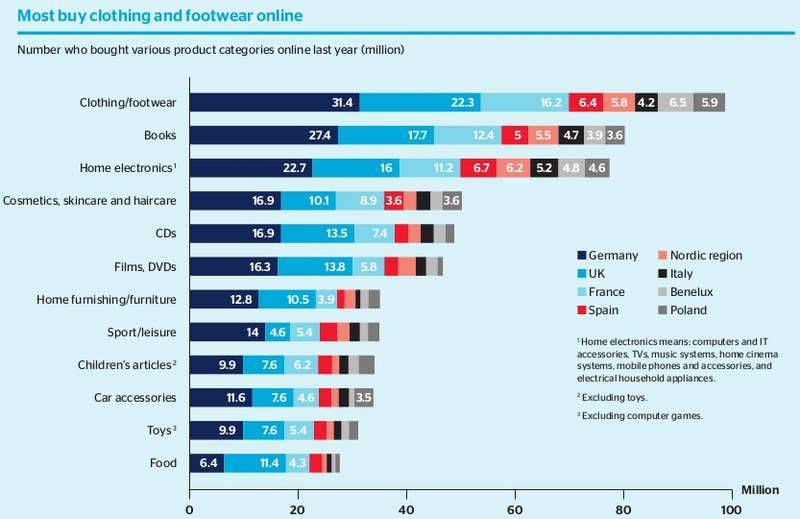 Based on data from the UK, Germany, France, the BeNeLux, the Nordics, Spain, Italy and Poland it found out that clothing and footwear are amongst the most popular product categories, just like home electronics and books. Ecommerce sales in Europe grew to 534 billion euros in 2017. Most of the online turnover is still being generated in Western Europe, which accounts for approximately 68 percent of total European online retail turnover. Southern Europe, Northern Europe and Eastern Europe show a much lower share of European ecommerce with 12, 8 and 6 percent respectively. As the Centre for Retail Research has found out, apart from the UK and Germany, market shares are comparatively low in many European countries. In 2016, the average online share of the European countries surveyed was 8 percent, while it’s expected to reach 8.8 percent in 2017. 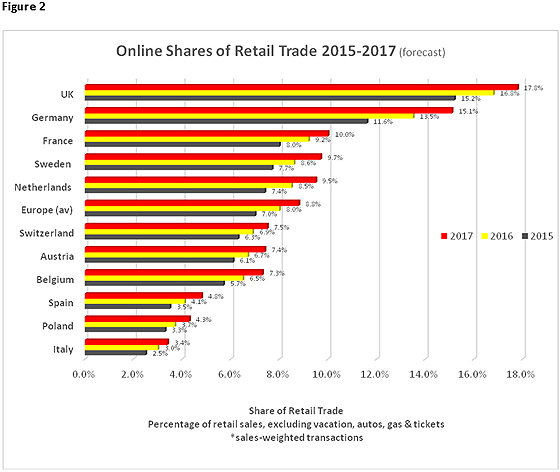 Countries where the ecommerce industry accounts for a fair share of total retail sales are the UK (17.8 percent forecast for 2017), Germany (15.1 percent) and France (10 percent). Not surprisingly, these are the biggest ecommerce countries in Europe. Other countries with high market shares are Sweden and the Netherlands. Of course, in Europe major American retailers have their influence on local ecommerce industries. As a matter of fact, Amazon was the most-visited online marketplace in Europe in 2018. But that’s not to say Europe doesn’t have its own ‘Amazons’. In Internet Retailer’s top 10 list of biggest online retailers in Europe, Amazon, Staples and Apple are the only American retailers. The list also contains Otto (Germany), Tesco (UK), Groupe Casino (France), Shop Direct Group, Home Retail Group (both UK), Zalando (Germany) and John Lewis (UK). April 10, 2019H&M is the latest major fashion retailer that’s changing its free delivery policy. The Swedish clothing company is now asking for a delivery fee for loyalty club members. This only applies to small online orders, but still, it’s another sign of what’s to come in European ecommerce. April 4, 2019Ikea is testing the rental of its furniture in all of its main markets. The furniture retailer first said it was looking to lease its products in February, but it now revealed more details about the furniture rental project it will run across Europe and other markets. April 1, 2019January is over, so it’s time for a fresh new month with fresh new ecommerce events to visit across Europe! So, as always, we’ve made a handy overview for you, so you know when and where an ecommerce event takes place this month in Europe. Read all our articles about ecommerce in Europe.